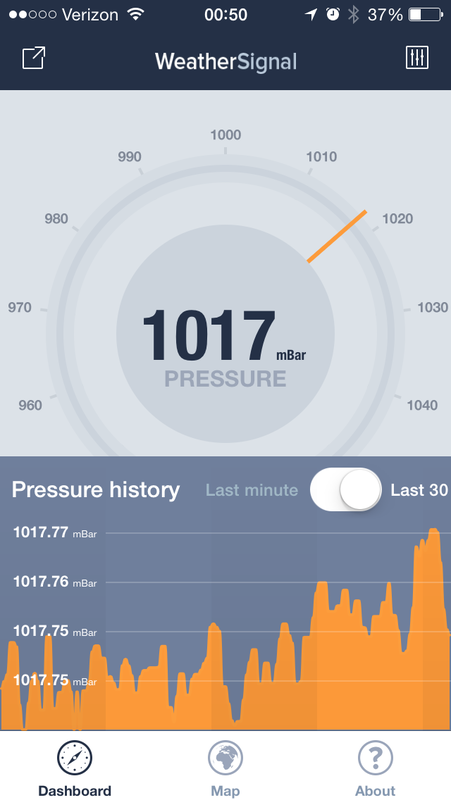 The pressure reading from my iPhone 6. The new iPhone 6 has a pressure sensor, and this may very well be the beginning of a massive increase in atmospheric weather observations. It comes at a time when computer power is making it possible to run numerical weather models at resolutions we’ve only dreamed of in the past. NOAA is already running a model with a resolution of 3km (the HRRR), and the UK Met office just bought a new forecast computer that will allow them to run a short-term model with a resolution of 1500 meters! To get the best out of these models, we need to give them an initial starting point with accurate data at this same resolution, and with millions of smart phones out there, this is very possible. In a few years it may be possible to initialize a model with a resolution of 1000 meters using pressures reported from a million smart phones! All of this is just in its infancy, but you can download a free app called Weather Signal to report your iPhone pressure to a national data base, and see a graph of your iPhone’s pressure. How sensitive is the pressure sensor in an iPhone 6? It’s 16 steps from upstairs to down in my house. The iPhone 6 pressure sensor easily detected the pressure increase. Meteorologist Cliff Mass (Professor at the Univ. of Washington) has more about the possibilities on the horizon, and details on similar apps for those with Android phones (which have a sensor as well). He has apparently been working to get Google interested in doing something with this data, and I am surprised to hear they have not jumped at the chance. Yes, this does open privacy concerns, but I think that is probably easy to solve, and I suspect most people wouldn’t mind a tiny snippet of info being uploaded (at their discretion) to improve weather forecasts. The data transfer is in bytes not megabytes, so cost is not really a factor here. Look at the map below of surface pressures in Colorado. This is from the High Resolution Rapid Refresh model initialized at 11 PM EST Monday night. (04 GMT, 11 Nov 2014). Imagine how much more accurate it would be with 10,000 additional pressure reports. We are going from synoptic scale to mesoscale and perhaps even microscale, and that opens up a whole new world. I’m willing to bet that data at that kind of microscale resolution will come with some big surprises, and more than a few mysteries! From NOAA. Surface pressure estimate for Colorado at 9 PM MST Monday 10 Nov. The future of weather forecasting may very well be the computer in your pocket! That is, in a word, astounding. The iPhone has always contained a highly accurate accelerometer and gyroscope and GPS receiver … the technology in the device is astounding. It is truly, in my opinion, worthy of another abused word: awesome. The reality of it; the miniaturization and commoditization … these are modern technology marvels. Marveled at by whom? Who’s astounded? Who is awed by it? Dan is. And that’s why I follow Dan. Thanks for interesting information, I’m willing to use WheatherSignal on my iPhone 6 running iOS 8.1.2, please tell e is it compatible with this iOS version?